In a country where talking about mental health is taboo, Chhori Maharjan has started a new dialog. As director of NYF’s Ankur Counseling Center (ACC) — the only psychological services clinic for children and adolescents in Nepal — Chhori is proud of the center’s role in changing attitudes towards mental health. We spoke with Chhori in a recent interview in her office in Kathmandu. She talked about changing the way people think about mental health and about the center’s pioneering work with children and young adults. The center has treated more than 4,000 children and young adults since it opened in 2006. Some children have suffered unspeakable trauma, and have found healing through Ankur’s use of innovative sand play therapies and other child-friendly techniques. Chhori explained the counseling center’s holistic approach to caring for the children in our programs. In addition to food, shelter and education, many of these children need help rebuilding their lives and are learning to write new stories for themselves. 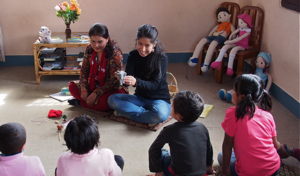 The Ankur Counseling Center has also become a leader in providing innovative training programs in Nepal for adults who care for or work with children. This is part of ACC’s mission to create a healthy, child-friendly environment in schools, homes, child care institutions and throughout the community. ACC staff and guest instructors also provide training to increase the knowledge and skill of professionals and paraprofessionals in the field of psychology. Participants come from throughout Nepal to attend ACC trainings, and more than 2,600 people have experienced the trainings so far. Read about the Ankur Counseling Center. I think this is a superb idea that not only will shake the very core of our nation’s beliefs, but it will help us strive to become more understanding to my generation of kids who believe that having feelings is not acceptable. Thank you for making this happen and I wish you best of luck!